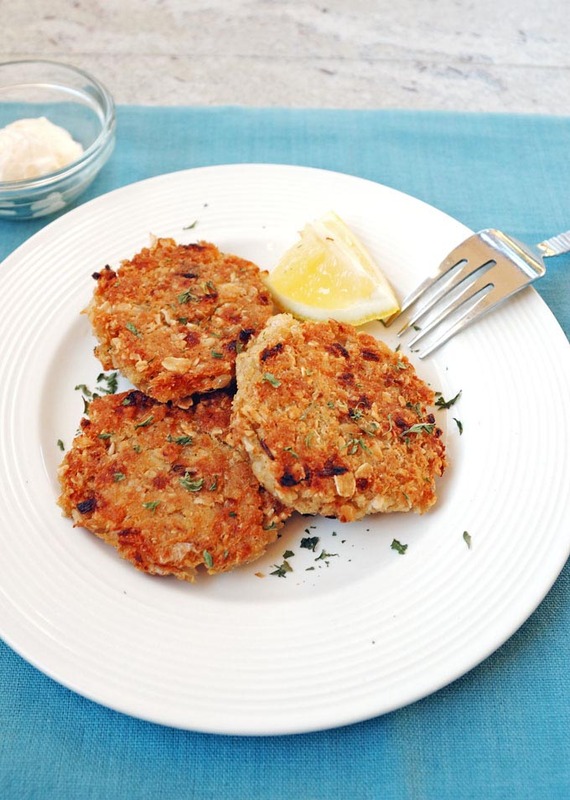 You’ll love these crispy Gluten-Free Crab Cakes! Crunchy on the outside, tender on the inside, they’re bursting with buttery, savory flavor. No strange ingredients, needed! Oh, how I love these crispy crab cakes! Crunchy on the outside, tender on the inside, they’re bursting with buttery, savory flavor from sautéed shallots that complement, rather than overwhelm, the delicious crab. Don’t look for any bits of pimento here, because there are none. I’m firmly in the camp that believes crab cakes shouldn’t be chunky. I decided then and there I needed to revisit my crab cake recipe. We’re very, very pleased with the results. If you love crab, you’ve got to try these! 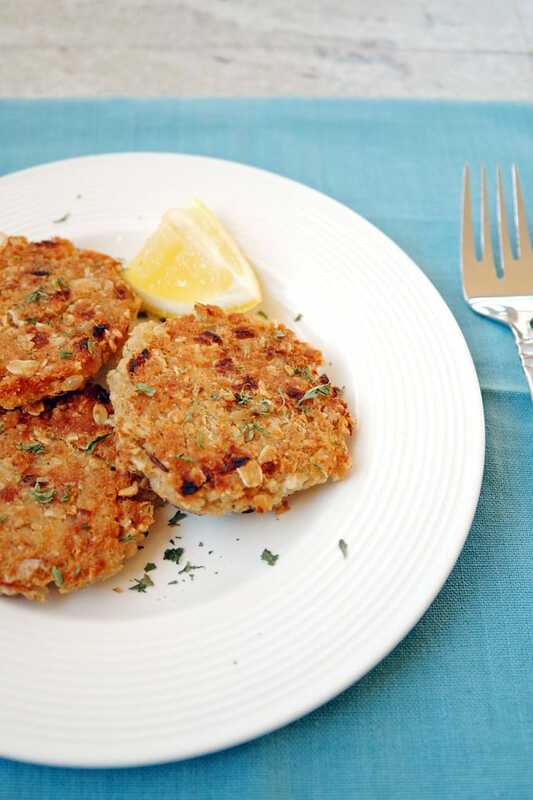 Crunchy on the outside, tender on the inside, these crispy crab cakes (gluten free) are bursting with buttery, savory flavor from sautéed shallots. Drain the crab in a fine mesh strainer and check for any bits of shell to remove. While it's in the strainer, press the crab with your fingers or a potato masher to release excess liquid. Transfer the crab to a small mixing bowl. If using rolled oats instead of quick oats, measure out 1/2 cup and pulse them in a food processor or blender to make them more fine. Gently stir the oats into the crab. Peel a shallot and finely chop about 2/3 of it, until you have 1/4 cup chopped shallot. Melt the butter in a large skillet over medium-high heat and cook the shallots in it until they are soft. Add the buttery shallots to your crab mixture. Beat an egg in a tiny bowl or measuring cup and add it to the bowl with the crab. Add the pepper and gently stir to combine. 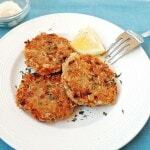 Cook the crab cakes for three minutes on the first side, and gently nudge them to see if they slide over easily. If so, the bottom is cooked and crispy enough to flip them over. Cook the second side for about three minutes, until the bottom is crispy. Drain the crab cakes on a plate lined with paper towels. 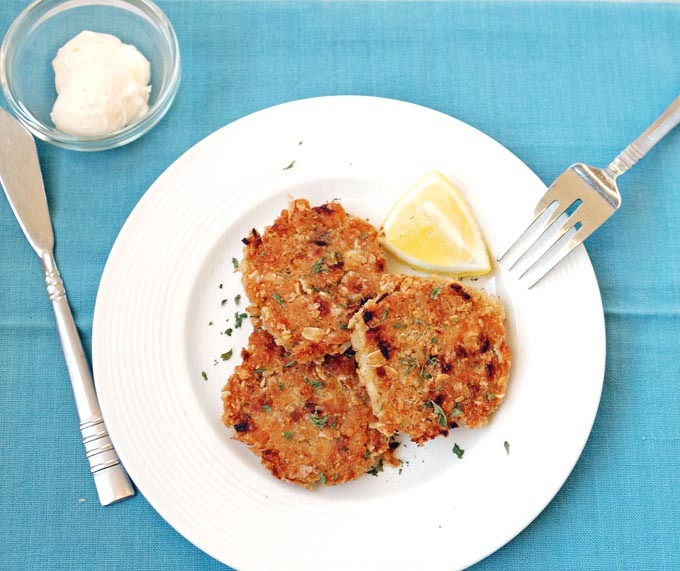 Serve the crab cakes with lemon wedges, and mayo, if desired. Garnish with parsley (optional). Store leftovers in the refrigerator for up to three days. I do love crab! And I love crab cakes, but like you, I’m kind of picky! I was spoiled…hubby surprised me with tickets to see Bobby Flay, way back in the day, and we had the chance to sample his offerings – one of which was a crab cake. It was heaven…so – I sort of feel sorry for all the cakes that have followed…but yours looks like a real contender! Thanks for sharing, my friend! How awesome to eat food prepared by Bobby Flay! That would definitely be a crab cake to remember. I bet he used fresh lump crab, which is the best, but not always available to me. Thanks, Annie! Hahaha! I’m sorry, but the checkered placemat is only scheduled for occasional appearances. 🙂 Thanks, Cheryl!